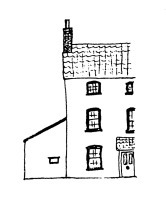 My name is James Osmond and this blog is all about the restoration of my house, a 300 year old listed building in south Bristol. Until 2016, I was quite happy enough juggling my career as a professional landscape photographer with the demands of being the principal carer for my three children. In January of that year though, my wife noticed an old house down the road being put up for auction and in a pretty rapid turn of events, we bought it and moved in. I don’t have any qualifications in the building trade, but I am probably what most people would describe as a ‘practical person’. I come from a family of engineers and the like, and though my own career has wandered off into the creative industries, I think a project like this is essentially a creative process built on an understanding of engineering principles. Perhaps that is why it appeals to me so much. Repairing and restoring an historic building is a time consuming process requiring a huge physical, emotional and financial investment. There is so much to learn and I’m surprised at how much I want to learn. I’ve only ever had a superficial appreciation for the aesthetic of historic buildings yet almost overnight, I have become what I can only describe as a ‘Lime Bore’. I find myself looking closely at roofing details and voluntarily visiting National Trust properties. I can now spot a Yorkshire Sash window a mile off. I’ve even entrusted a few close friends with the task of quietly tapping me on the shoulder if I spend too long wittering on about lime plaster, because I know this is not everyone’s cup of tea. It never used to be mine and yet suddenly I find it all fascinating. Some of our friends and family are interested in what we’re up to as well so I thought I’d record the progress and process of this project in blog format. It seems only right to document it in some way for posterity and this way, anyone who’s interested can read all about it.